An advantage of shape based techniques, for object analysis tasks, is that shape allows a large number of numerical characterizations. Some of these have an intuitively clear meaning, while others do not, but they are still very useful because they satisfy some desirable properties (e.g. invariance with respect to a set of certain transformations). In this chapter we focus on numerical shape characteristics that have a clear intuitive interpretation – i.e. based on such numerical values, we can predict, to some extent, what the considered object looks like. 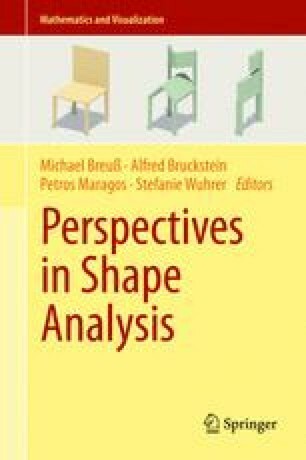 This is beneficial, since it enables a priori appraisal of whether certain shape characteristics have suitable discriminative potential that make them appropriate for the intended task. By their nature, the number of such methods cannot be as large as the number of methods to allocate shape/object characteristics based on some formalism (algebraic, geometric, probabilistic, etc.). Because of that, some other possibilities to increase the discriminative capacity of the methods based on numerical shape characteristics, with an intuitively predictable meaning, are considered. Herein, we observe two such possibilities: the use of tuning parameters to obtain a family of shape characteristics, and the use of multiple shapes derived from the objects analyzed. This work is partially supported by the Ministry of Science of the Republic of Serbia.